Solar flaring activity at the Earth facing side was very low. The sunspot regions remained quite stable. 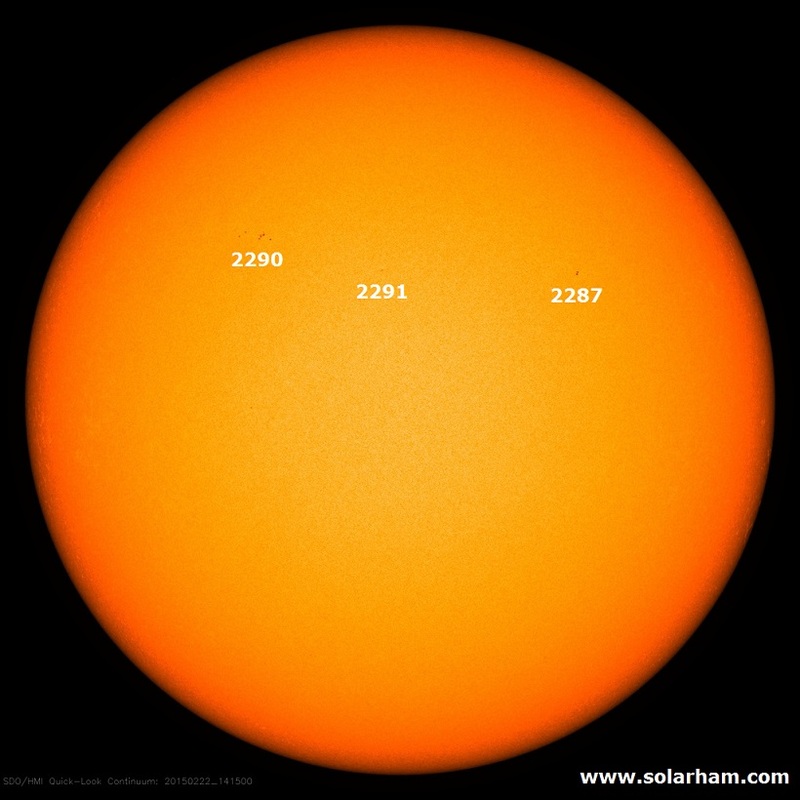 Some minor development in the intermediate spots of NOAA active region 2290 was seen. A full halo CME was detected in SOHO LASCO/C2 (first measurement at 9:24 UT On February 21) and C3 (10:06 UT), which is believed to be associated to a Backside event. The CME was followed by a few more narrow CMEs. The CME is asymmetric with the largest component heading to the southwest with a projected speed of 976 km/s (CACTus estimate). STEREO A EUVI images indicate flaring activity and the disappearance of the long filament located in the backside southern hemisphere. PROBA2/SWAP (start at 9:19 UT), SDO/AIA (9:24 UT) and GONG H alpha imagery observed the filament eruption as well. The proton flux (at > 10 MeV) has risen to enhanced levels starting around 12 UT, but did not pass the event threshold and is near 1 pfu. We set a warning condition for the further increase of the proton flux. The arrival of a backsided CME shock is possible. A filament eruption was visible in EUV imagery starting in PROBA2/SWAP at 18:09 UT on February 21, accompanied by a long-duration B7 flare. Flaring activity is expected to remain very low to low. Nominal solar wind conditions were observed, with the magnitude of the interplanetary magnetic field maximally at 7 nT. The solar wind speed decreased from 360 km/s to around 320 km/s. Geomagnetic conditions were quiet to unsettled (K=1 to 3) at the local level (Dourbes) and global level (estimated NOAA Kp), which is expected to continue till the arrival of the anticipated coronal hole high speed stream possibly resulting in active geomagnetic conditions within the next 24 hours (K=4, with a small chance for K=5).